Imagine a lonely, desolate world without magnificent creatures such as elephants, rhinos, gorillas, hippos, zebras and giraffes gracing the wild. One in which perhaps a few abject stragglers survive behind bars in zoos as objects of regret or ridicule for hordes of gawkers. Imagine a world that is bursting at the seams with just one large mammalian species – our own Homo sapiens – who due to a lethal combination of numbers and power, ignorance and arrogance, greed and need, has wiped out all the other large terrestrial mammals with whom we have shared the planet since our ancestors first dropped from the trees to the savannas of the Great Rift Valley in East Africa and began walking upright. You would be imagining a wasteland called Earth in the near future. For this is where we are headed. The one thing that is inaccurate in the dystopian image I have painted above is that Earth wouldn’t exactly be rendered into a bleak wasteland. Far from it, for it would be teeming with billions of domesticated herbivores – cattle, sheep, goat and the like – where once the wild creatures roamed freely. The obsolete wild world would be tamed and reinvented as one large factory farm. The largest, most iconic wild herbivores on Earth are facing collapse. End of the Line? 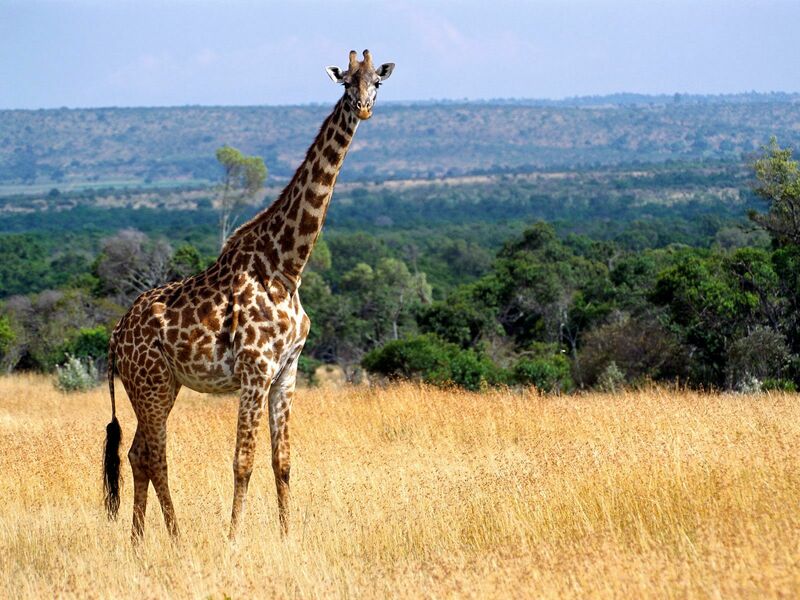 Populations of giraffes and other large herbivores are crashing. That is the startling conclusion of a scientific paper – “Collapse of the World’s Largest Herbivores” – published on May 1, 2015, in the American Association for the Advancement of Science’s journal Science Advances. Large herbivores are generally facing dramatic population declines and range contractions, such that ~60% are threatened with extinction. Nearly all threatened species are in developing countries, where major threats include hunting, land-use change, and resource depression by livestock. In an interview with National Geographic, lead author William Ripple of Oregon State University in Corvallis, Ore., indicates that one finding of their study is that the demand for meat, not habitat destruction or takeover by livestock, is the single greatest threat the large herbivores now face. Given explosive growth of the human population in Africa this shouldn’t be altogether surprising. As its death rate has plummeted and birth rate remained very high, Africa’s population has tripled since 1950 and is on a disastrous trajectory to approach 4 billion by 2100, according to U.N. projections. Most Sub-Saharan Africans are impoverished by global standards, and many are hungry or malnourished. “Bushmeat” (wild game) is a part of traditional diets, and demand for bushmeat has skyrocketed along with the population. Contrasting demographic projections of Africa and Europe. Africa is undergoing a population explosion of a magnitude unprecedented in history. Some of the slaughter is due not to the demand for meat but to the demand for animal body parts, such as the elephant’s tusks, which of course are made of ivory. Poachers murdered 100,000 African elephants in just the last three years. National Geographic reports that one out of every 12 African elephants was killed by a poacher in a single year (2011) alone. Last year (2014) set a record for poaching in South Africa, which has a world-renowned system of national parks. But large, unguarded parks can just as easily become slaughter-grounds as any other site; being natural or wilderness alone is no guarantee of sanctuary to the wildlife that resides there. Providing effective protection is enormously expensive, often prohibitively so, for the strapped governments of poor countries. Last male northern white rhino on Earth guarded round the clock by armed rangers. As I wrote in Africa Science News a couple of years ago, 1.4 billion Chinese consumers – many of whom covet ivory for its beauty and as a traditional status symbol, and who now for the first time in history have the means of purchasing it thanks to China’s growing wealth – will determine whether or not the extraordinary African elephant survives or goes extinct. But hundreds of millions of African consumers and prospective parents – whose numbers are growing much faster than China’s – will determine whether there is still a place in their ever more populous countries for some of nature’s most majestic, iconic wild mammals.